Meike MK-RC7 2.4GHz flash trigger: better than RF-602s? 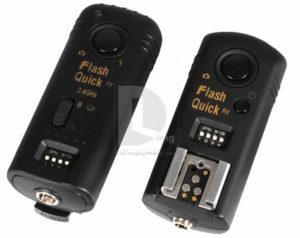 Meike has released a 2.4GHz trigger that is cheaper than Yongnuo RF-602s, called the MK-RC7 Flash Quick. Could it be the ultimate value-for-money flash trigger and shutter release? So far there have been many contenders to the title of “best budget flash trigger” currently held by Yongnuo RF-602s. In the 2.4GHz budget trigger market we have seen the arrival of Pixel Pawns and Soldiers, Phottix Stratos and Hähnel Combi TFs, all with various advantages over RF-602s, but all of them are more expensive, some even more than twice the price. However, Shenzhen-based company Meike has brought out an improved trigger that’s the cheapest 2.4GHz model so far seen on the market. The Meike MK-RC7 “Flash Quick” triggers very much resemble Yongnuo RF-602s in functions, and initial appearance, but offer several key improvements. Autofocuses remote cameras on transmitter half-press. Bulb, continuous shooting and self-timer support. The Meike MK-RC7 is available to buy on eBay for approximately US $30 for a transmitter/receiver set, with extra receivers priced at around $20 each. Though some listings are titled “for RF-602”, it is unlikely that they are compatible. You can also buy from the LinkDelight web site. The only differences between the various kits are the included shutter release cables. Both the transmitters and the receivers have universal Canon/Nikon hotshoe pinouts. There are shutter release cables for most cameras. If yours is not yet listed, you can also use Yongnuo cables available on eBay.